In our “Voices from the Movement” series you will hear stories directly from buildOn students, teachers, community members and supporters about why service matters and how it inspires change. When we are cleaning up the street we often find hidden memorials that show where people died. Today I found a balloon and some dried roses. I’m guessing it was a little boy or a little girl who died because the balloon was really colorful. There were a lot of bottles next to the flowers too. I think they are there because people come and sit to remember their friends or loved ones. The police don’t really let you put things down where people died. I don’t know if they know what it means, or if they are worried that other gang bangers will come. Because when the death is gang related the other gang will come and try to mess up the memorial because they know it means something to the hood. We wanted to come out and clean this block today because we feel like every thing we can do to improve our community helps. Sometimes you are judged by where you live. Like right now if someone was to come here they would be like, “be careful because that’s the ghetto. They might try to break into your car, or steal it, or something.” But you can make a difference and you can let people know your neighborhood isnt’ as bad as it seems. My neighborhood’s not bad, and people shouldn’t judge it just because of what it looks like. Everyone who lives here isn’t a gang banger. By serving in my community I get to prove that. 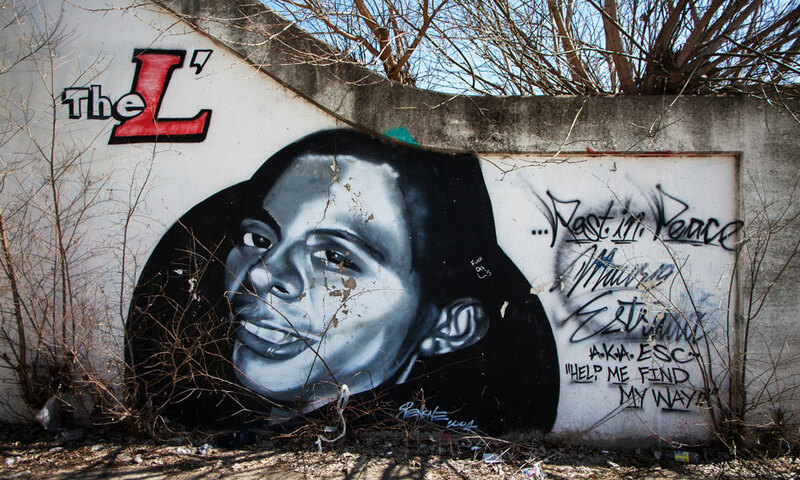 Pictured: (Above) A mural under neath the “El Train” tracks memorializes a local fallen youth; (Below) Cynthia and her fellow buildOn students from Gage Park High School clean-up the streets while working to improve their neighborhoods reputation.